A staple and dependable tool for simple deburring tasks. The Edge Off comes with a heavy-duty S10 blade. Blade is NOT replaceable. Handy pocket clip so that you can keep the Edge Off handy at all times. The heavy-duty tool uses any size "S" style blade. Comes supplied with S10 blade and pocket clip. An improved version of the original Noga Burr, the Noga Burr 3 is capable of holding any "S" blade. Blades mount directly onto handle allowing for better control and a more precise cut. S10, S20 and S35 blades. This 14-piece set comes complete with NB handle, and 1 each of S10, S20 and S35 blades, along with 10 S10 blades. Also available, Noga Burr 3 with 10 TiN Coated S10 blades. Six-piece set includes NB handle, S10, S20, S35, S101 and S202 blades. Blades rotate and can be stored inside the handle. Quick blade change by pressing safety button. Blade is removable and replacement blades are available. 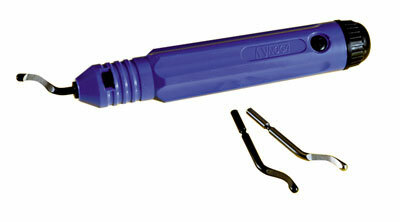 Universal deburring tool has telescopic, double-headed holder. One end holds standard "N" blades while the other end holds heavy-duty "S" style blades.